This is the place to see my jewelry creations as they are done. Hello everyone, this was a wonderful weekend at the women show on november 3 and 4. Thank you for your support. I do handmade jewelry since 2009. I work with freshwater pearls, Swarovski crystals, stones, glass beads, chains, seed beads and more. My moto is quality craftmanship makes nicer jewelry. I took some jewelry classes to learn techniques and the rest is from my inspiration. 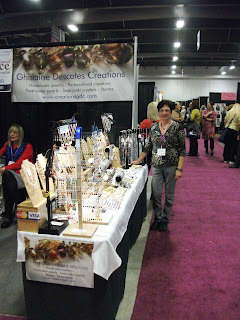 I am a member of Capital Artisans Guild and Ottawa Crafts and Collectibles Guild.